For over twenty years Michael Mittelman has been experimenting and exploring new materials and processes in contemporary art. Along this journey has been a consistent need to maintain an aspect of the analog, even while using the most digital of means. In his earliest works in virtual reality, Michael was extracting the object into real space and then merging it with the virtual images. In his most recent work, Michael is using digital fabrication techniques on natural materials. This talk will discuss the journey between then points and the ideas that have driven it. Michael Mittelman has a background in both architecture and fine arts, completing studio art degrees at Wesleyan University (BA) and Massachusetts College of Art (MFA), including a year-long architecture intensive with the Columbia University New York/Paris program. For over twenty years, he has been working at the intersection of art and technology. In the mid 1990’s, Michael was creating virtual reality sculptures and then realizing them in welded steel. At the turn of the millennium, he was creating interactive installations which explored the psychology of domestic environments. Since 2013, Michael has been using digital fabrication to create sculptures which express the new possibilities of these methods of creation while simultaneously retain the analog properties of their materials. Core to Michael’s process is rapid iteration through early stages of exploration by using software and then settling into a refinement process that includes full physical realization of the concept. 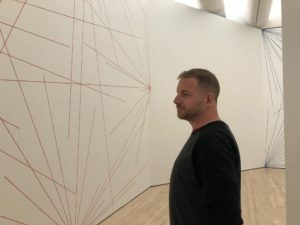 His sculptures, installations, and digital art have been shown nationally, including at the List Center for Visual Arts and the deCordova Museum and his work is in the Spalter Digital Art Collection. This post was written by atneprograms2 and was published on March 17th, 2019 under the categories Events , Past Events.